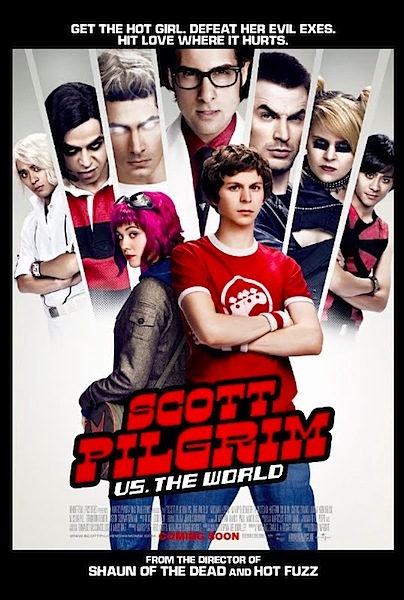 Actually, I saw Scott Pilgrim vs. the World on opening night, but then I went on vacation and forgot to post about it. Oops. I don’t think my recommendation would have helped, though, since the negative judgments came in fast and furious, whether it was hatred for the presumed ‘hipster’ audience, the wrong release date (up against the much more testerone-y Expendables), the inability of geeks to open a movie, the tendency of the presumed target audience to download films for free, or comprehensive lists that blamed everything from loathing of lead actor Michael Cera to no clear target audience. In some ways, I enjoyed the movie more than the final book, although that was an entertaining read in its own way. Due to the limited length (movie running time instead of six graphic novels), the story was tighter, with a more distinct narrative arc. While Sin City showed how to use a comic as a movie storyboard, Scott Pilgrim vs. the World better played to the strengths of the film medium. I got some of the video game references more easily, for example, seeing them executed visually with movement. Along similar lines, some of the plot elements made more sense to me in this version of the story. At times I found myself thinking, “oh, that’s why that was in the book, it was used here.” Plus, there was less of the mopey stuff that bogged down four and five a little bit, since the movie doesn’t have to deal with Scott growing up and getting a job. Instead, this becomes more of a band movie, with an arc that follows the group struggling to get noticed. More Stephen Stills (Mark Webber) was a welcome result. There were some things left out that I missed, most obviously for me the library fight between Knives Chau (Ellen Wong) and Ramona. That’s one of my favorite scenes from the books because of the architecture and the way it plays into the staging. But there was still plenty for Knives to do, and she was a gem. I also missed Envy Adams (Brie Larson) having more of a development arc and getting to know her as a character instead of a plot point. The outstandingly best thing about the movie, though, was gay best friend Wallace Wells, played amazingly by Kieran Culkin. His lines and attitude were hilarious, and I was always laughing at any scene he was in. Brandon Routh (evil ex #3) was also a hoot. The best fights were at the front end of the card, with Routh and Chris Evans (#2) the high points. The latter battles took on less importance, as we cared about other character struggles by then. Regardless of the reaction, I’ll be buying the Blu-ray as soon as it’s available and expect to enjoy it over and over again.